Shirley Muramoto and the Murasaki Ensemble. Bay Area koto master Shirley Kazuyo Muramoto will appear in two kinds of concerts this weekend. • Saturday, Oct. 19, at 8 p.m. at Smith Center, Ohlone College, 43600 Mission Blvd., Fremont. Join the Fremont Symphony Orchestra as it demonstrates the richness of our world through music—a musical journey spanning over 300 years and 12 countries, exploring the diversity and unity of the human spirit. “World Tour: Unity” begins in Russia with the breathtaking final movement from Tchaikovsky’s Symphony No. 4. Maestro Gregory Van Sudmeier then leads us through a thrilling amalgamation of East and West as the Symphony plays “Yangtze Boatmen’s Chantey” and other Chinese folksongs, including the hauntingly beautiful “Prairie Song” featuring the pipa with soloist Hecheng Liu. Muramoto and her son, Brian Mitsuhiro Wong, follow with a surprising blend of East-West music. Next will be selections from Indian composer A. R. Rahman’s Academy-Award-winning film score for “Slumdog Millionaire,” followed by incomparable Irish tenor Liam Tiernan, who began his career in Belfast with the Barleycorns, selling 3 million records worldwide. America is represented with gospel mezzo-soprano Erica Richardson and chorus performing “Ragtime’s stunning song” “’Til We Reach That Day.” The Reyes brothers, Carlos and Julio, add a South American touch with an energetic romp featuring Paraguayan harp and acoustic guitar. This celebration of 50 years of the Fremont Symphony Orchestra honors the wide variety of cultures in the community and the rich musical traditions of the orchestra, and celebrates its unity of spirit. There is nothing like music to show us that we are more alike than different. Box office opens two hours before showtime. Info: (510) 371-4859, www.fremontsymphony.org. • Sunday, Oct. 20, at 3 p.m. at Congregation Beth Shalom, 1705 Sherwood Ave., Modesto. Muramoto will perform with her group, the Murasaki Ensemble, a musical experience of sounds unlike any other — elements of traditional Far Eastern subtleties, Near Eastern and Latin American rhythms, converging with improvisational jazz, producing a sound that is extremely vibrant and innovative yet still familiar. Sunday Afternoons veterans will recognize band member Matt Eakle, most recently on the stage with his own band in 2010. 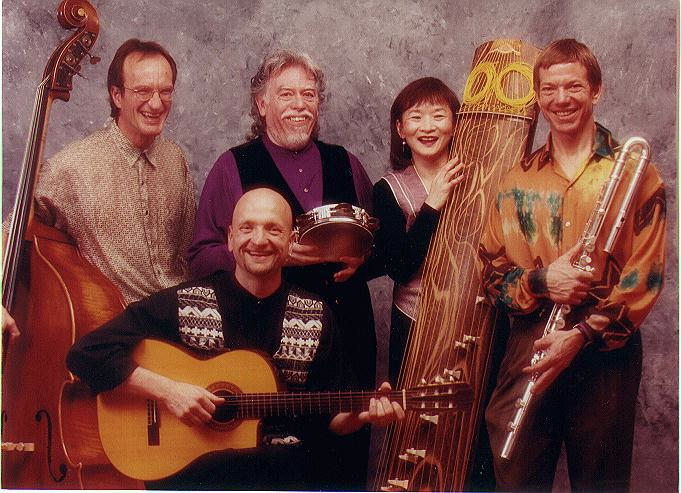 The ensemble’s sound reaches the inner spirit and a unique ability to combine traditional instruments in exciting ways. Intricate Egyptian riqq (tambourine), Arabic tabla, Latin congas and bongos with the jazzy sounds of upright bass and acoustic guitar, providing a framework for the group’s musical explorations while koto and silver flute add texture, punctuating the rhythm with enticing melodies. The meeting of old and new, East and West, the Murasaki Ensemble strives to present a new listening experience — one that involves interaction among all participants and flows with an intensely global, human quality. For tickets and more information, call (209) 571-6060, email [email protected] or visit www.cbsmodesto.org. Each concert includes a complimentary “high tea” intermission, featuring artisan breads and pastries from David Bradford. For more information on the band, visit www.murasakiensemble.com.